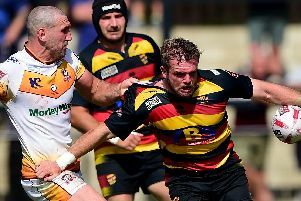 Clive Griffiths makes no secret of his dislike for 3G pitches ahead of tomorrow’s Championship clash at Ealing Trailfinders. “I’m totally against playing on such pitches,” said Doncaster’s director of rugby. “Rugby is meant to be played on grass or at least hybrid pitches. “Players can pick up some nasty injuries such as grass burns playing on these sort of pitches and they can have an impact on training for the next game. “We’ll just have to make sure that the vulnerable parts of the body, such as the knees, are covered up the best we can. The club’s squad have trained on a 3G pitch this week as part of their preparation. “The bounce of the ball is different, so is the scrummaging and the game as a whole is faster,” said Griffiths. The Welshman says he is expecting a tough, physical challenge in London. “They’ve spent a lot of money on players and they have put together a massive team with a lot of experienced players.” he said. “They can play but from what I saw of their game against Jersey they are very forward orientated and very set-piece oriented. “They might change their tactics having had a look at us and they might feel we’ve got some weaknesses elsewhere.